I've already written about my experiences with the Michael Todd Soniclear and Soniclear Elite, and today I want to share with you their cleanser and toner that I've used both with the Soniclear Elite and on its own. With a name like Charcoal Detox, I knew my oily skin was in for a treat. With a light, refreshing tea tree scent and a grey, lightly foaming texture, this cleanser makes my skin feel clean and fresh. It works well just massaging it into my skin, but it feels amazing when paired with my Soniclear Elite (and even my Foreo Luna). The vibrations of the brush aerate the cleanser, but don't make it too bubbly or foamy, and between the sonic vibrations and the charcoal and other natural ingredients, my skin is so clean. 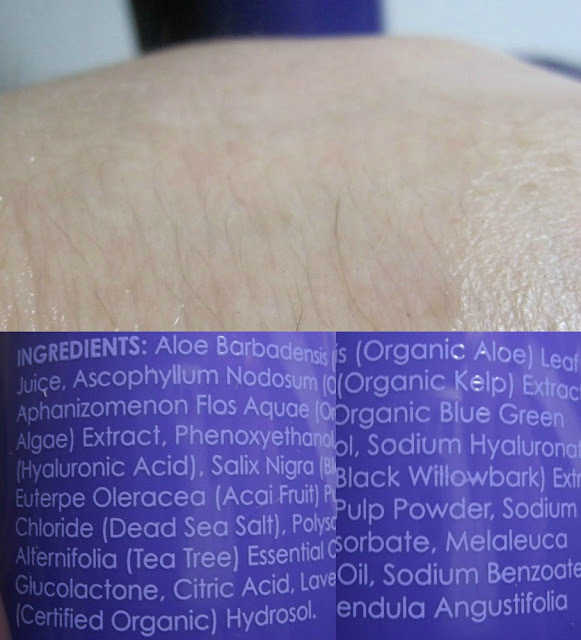 It also has aloe to soothe, and other botanicals to stimulate cellular turnover to reveal newer skin. It's gentle enough for me to use every day. The Michael Todd Charcoal Detox cleanser is available for $23 at Ulta. Another product that I've totally rethought is toner. I grew up with all toners being very harsh, drying, and astringent. The thought then was that oily skin needed to be really dried out in order to not cause breakouts. Now we know that oily skin needs moisture and balance to produce just the right amount of oil, while keeping the skin clear of pore-clogging debris and toxins. Toners can help with that, and also prep the skin for serums and moisturizers. I've never tried a toner with kelp and algae extracts before. They are gentle ingredients meant to soothe and nourish the skin while drawing out toxins and helping rebuild the cellular structure of the skin. It also contains Black Willow Extract, which is an anti-microbial, and Hyaluronic Acid and Aloe to moisturize the skin. It smells like tea tree to me, and that's also one of the ingredients. It's clear, light, and leaves no residue behind. I prefer to mist my toners on, but the pump on this bottle is better for those who want to apply some to a cotton pad. The Michael Todd Blue-Green Algae Toner is available for $19 at Ulta. 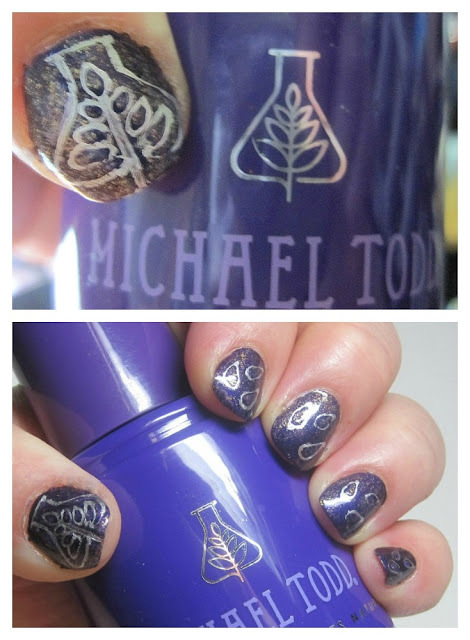 I neglected to keep a record of the polishes I used in my Michael Todd-inspired nailart. The purple flakie is a Wet 'n Wild polish. I believe the silver is Essie No Place Like Chrome. I freehanded the logo and design. Given my druthers, I would change the scent - just because I like other scents more than tea tree, which is a little medicinal to me. I would also change the toner to a mist applicator. Other than that, I really enjoyed using these as the first steps in my skincare process. I want to look as young and radiant as long as I can, and keep the breakouts at bay, and my Michael Todd system helps me do just that! If you'd like more information about Michael Todd Organics and the Soniclear, you can find them on their website, Facebook, Twitter, Pinterest, and YouTube. Have you tried Michael Todd?